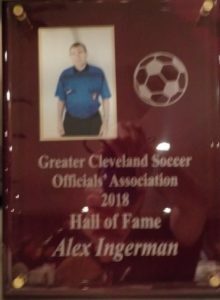 Welcome to the Greater Cleveland Soccer Officials Association Hall of Fame page! 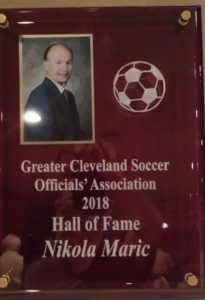 This page is in dedicated to honor individuals for their outstanding performance, service, and commitment to High School soccer in Cleveland. This award recognizes those who have provided excellent service to GCSOA as a referee, board member, administrator, instructor, assessor, mentor, assignor, or other member of the GCSOA community who deserves to be recognized. A special thank you to the Selection Committee for their work selecting this year’s class. The committee consisted of Tom Lewis, Wayne Wilson, Alex Ingerman, Ed Jarus, and Jeff Zabukovec. Alex is being inducted for his contributions to GCSOA as a referee, mentor and assessor. Soccer has played an essential part in Alex’s life for almost 60 years. Alex has played, coached and refereed the sport throughout the course of his life. Alex has been a GCSOA referee for 36 years, officiating countless playoff games, including one State Championship and multiple State Semi-Finals. Alex has played, coached and refereed the sport throughout the course of his life. Alex’s experiences on all sides of the ball have allowed, and continue to allow, him to mentor to some of the most successful referees in GCSOA’s history. Bill is being inducted for his contributions to GCSOA as a referee, mentor, assessor, instructor and former board member. Bill has been a high school referee for 27 years. In addition to his dedication on the field, Bill has been an instructor for 23 years and served as the GCSOA Rules Interpreter for 5 years. Bill continues to mentor and assess referees throughout the state for high school, college, and USSF. Regarded today as one of the state’s best instructors, Bill is also a National Clinician for NISOA. 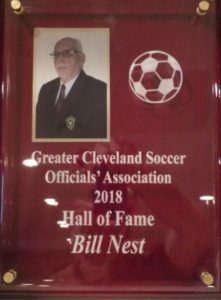 Bill’s leadership for referees of all levels heavily contributes to the success that referees in Northern Ohio continue to experience. Joseph is being inducted for his contributions to GCSOA as a referee, mentor, and assessor. “Papa Joe” was a referee for OHSAA and for NISOA for 20 years. Joe was a founding member of NOCSOA, held titles of SDI and SDA for Ohio North, and was a USSF National Assessor for 15 years. 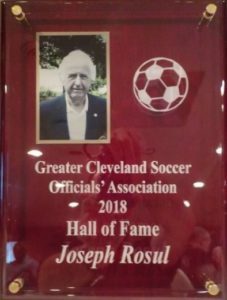 His contributions to soccer in Cleveland go beyond officiating, as he helped establish the sport in the area’s public schools, just as he did when he helped found the Ukraine Soccer Club in 1949. Joe mentored and assessed some of the most successful and decorated referees and assessors not just in the state, but also in the country. “Papa Joe” was also inducted into the North American Ukrainian Hall of Fame in 2009, an accolade he shares with the likes of Wayne Gretzky, Mike Ditka, and fellow GCSOA Hall of Fame Inductee Andrew Sheparovich.